For my birthday this year, a friend surprised me with a black sesame cake filled with layers of chocolate ganache. 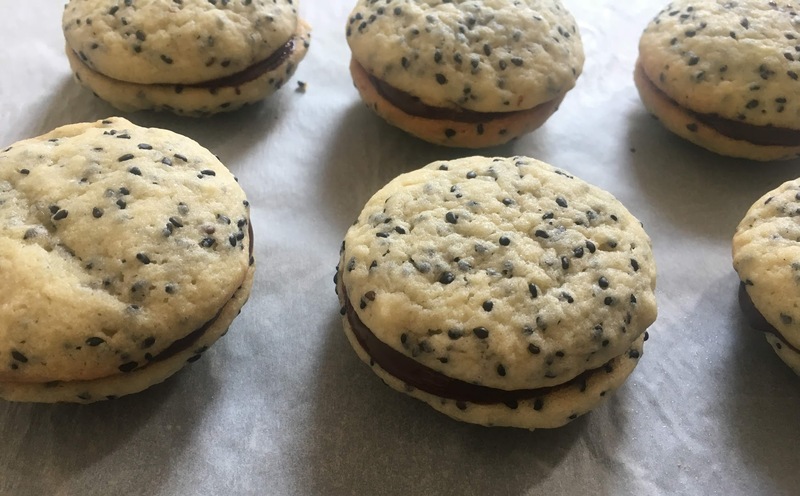 Inspired by those flavors, I incorporated black sesame, an Asian ingredient used in ice cream in Japan, as well as glutinous rice dumplings and sweet soup in China, into a classic American dessert: the sandwich cookie, made popular with the invention of the Oreo in 1912. 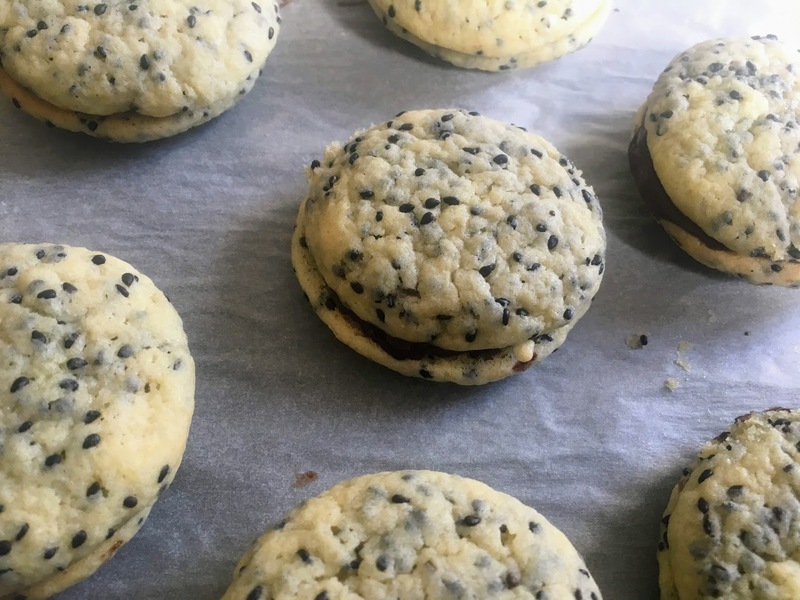 With the nutty flavor of the seeds and a simple filling made from dark chocolate and butter melted in the microwave, these cookies have the perfect balance of savory and sweet. Preheat oven to 425 degrees F. Line two baking sheets with parchment paper. In a small bowl, combine flour, salt, and baking soda. Set aside. In a large bowl, cream together butter, sugar, and black sesame seeds until light and fluffy, about one minute. Stir in eggs and vanilla extract until smooth. Add flour mixture, stirring until just incorporated. Scoop level tablespoons of dough and roll into balls. Place at least an inch apart on prepared baking sheets, and flatten slightly. Place in oven and immediately reduce temperature to 350 degrees F. (The transition from higher to lower temperature helps the cookies form crisp edges while remaining soft in the middle.) Bake for 11-12 minutes, until bottoms and edges turn golden brown, and cracks form on the surface of the cookies. The tops of the cookies will remain quite pale. Set aside to cool. While cookies are baking, prepare the filling: in a saucepan or small microwave-proof bowl, combine chocolate (I used a 70% dark chocolate bar) and butter. Microwave for around a minute, or place on stove over low heat until fully melted. Stir until glossy and smooth. Set aside to cool, stirring occasionally, until mixture has thickened. Flip over half the cookies, and spread chocolate mixture over the bottom of each cookie, in whatever thickness desired. Place the remaining cookies on top to form sandwiches. Wrap leftovers in tinfoil or place in an airtight container, and store at room temperature. Yields around 16 sandwich cookies. I’ve never heard of black sesame, does it taste similar to the blonde variety? This is such a unique idea I love it. Thank you 🙂 Black sesame has a slightly richer, nuttier flavor than the blonde variety. They are basically the same seed, but black sesames still have the hull attached, which adds a little more flavor.